The lack of face-to-face interaction with the teacher and other students of a web course can make it difficult for students to feel actively involved. It can also create a sense of confusion about teacher expectations and student responsibility. In order to combat this confusion and the unease that accompanies it, it is important that your web course has a strong structure that lets students know what is expected of them. In addition, the learning environment should be supportive and resourceful in order to facilitate knowledge construction and application (Chen, Hsu & Caropreso 2005). The following are suggestions on how a web course can be structured in order to facilitate student comfort and active participation. The suggestions are divided in four parts: orientation, scaffolding, intervention, collaborative learning. What assignments will need to be completed during the course? What are the roles that the students will have? How will course grades be determined? How will each assignment be graded? Within what timeframe can a student expect a response to an email? When/ how often will feedback be given to students? What technology will be used for the course? What are the relevant features of the technology? Is it necessary to do a walk through of the online learning environment, in the form of a synchronous chat or a video? 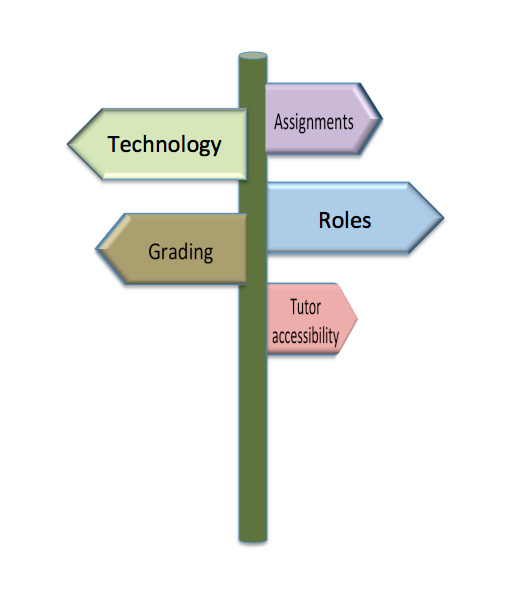 Is there technical support for students? How the outline of the course is presented and what kind of environment is used usually depends on the facilitator of the course. The main goal is to have an easily understandable environment that can be used if students have cultural differences, so it could be either a wiki, a blogging environment or some project management tool. Which one of them to choose depends on the task ahead for the group. Basically a project management tool is good for having a common place for the group to work together, to assign tasks, check overall process etc. A wiki is a collaborative writing tool, which is meant for groups that have a long lifespan in order to save/record the information for future users. Blogs are used for individual purposes if each group member has their own assignments to fulfill and present. If there is a need to share files or some larger documents, it is best to use online file sharing instead of large emails. This way one can put the files into the cloud and they are easily accessibile for other members. For a more detailed overview on the use of tools read Technologies and Environments chapter. Also in the Environments and Tools section some of the tools, that are suggested to be used for certain activities, are described in more detail. When assigning an activity, an instructor usually has an idea of what they expect the students to do in order to meet the requirements of the task. However, these expectations are often not adequately conveyed to the students. A good way to avoid confusion about an assignment is to use scaffolding. 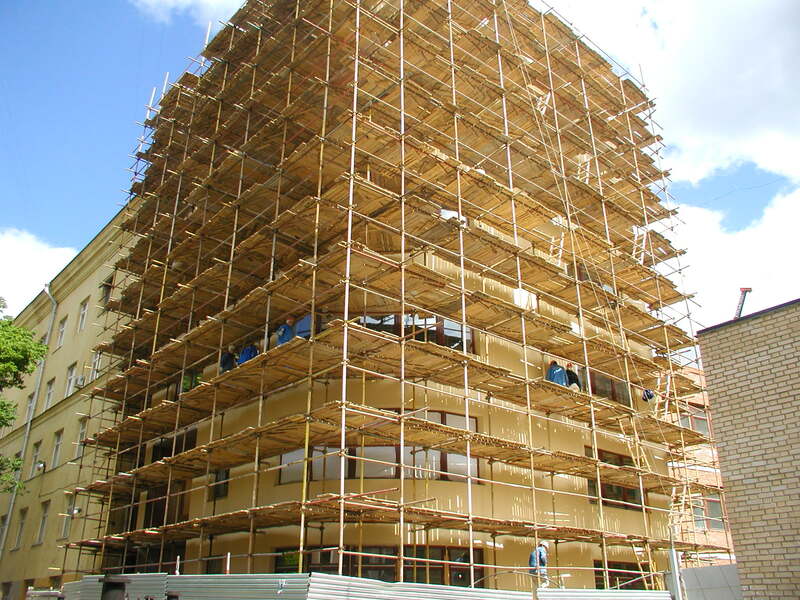 Scaffolding is “the assistance (parameters, rules or suggestions) a teacher gives a student in a learning situation” (eHow.com). Scaffolding is helping students to learn by giving prompts and hints, sort of building units that help them to construct and figure out the knowledge on their own. In scaffolding the help is tailored to an individual student's needs in achieving his/her goals in a way that contributes to learning. Large projects can be broken down into smaller parts with individual deadlines. This type of scaffolding can help keep groups of students, who, due to cultural differences, may have difficulty making and keeping an appropriate working schedule, on task. This type of scaffolding is especially helpful when students will be completing an unfamiliar task. In this scenario, an instructor would hold synchronous meetings in order to walk students through a task similar to the one that has been assigned. A task rehearsal will help give students the confidence and specific skills they will need when completing the actual assignment. Rubrics are assessment tools that give specific criteria and levels of proficiency for a task. They help teachers assess student performance, while informing students of the standards and requirements of an assignment (Montgomery 2000, 325). Rubistar is a website that can be used to create rubrics for project-based tasks. Assigning students specific roles to play in a collaborative exercise can lead to more productive work. In group projects, some students may have difficulty figuring out what part they should be playing in the collaborative process. When a student is assigned a specific role, it can give them a stronger sense of purpose within the group. Role play is an especially good way to help students understand what kind of expectations the instructor has for student participation in a group task. It is also a way to make sure that ALL students participate. Role play promotes both individual responsibility and group interdependence (Pozzi 2011, 47). In this chapter the focus and the approach for pedagogical design is on self-regulated student learning and process-oriented teaching (Vermunt & Verloop 1999), which is very different from traditional lecture-based teaching. Process-oriented teaching can also be called as active and self-regulated based learning (Bakkenes, Vermunt & Wubbels 2010). In process-oriented methods a teacher has many roles to fulfill, such as, the role of diagnostician, challenger, model learner and activator. In addition, a teacher should monitor and reflect on students’ learning processes (Vermunt & Verloop 1999). Students can be required to write journal entries or regular reflections for the duration of the course. To make sure that the instructor is gaining relevant information, the students could be given a list of questions to answer for each journal entry/ reflection. The most well-know online journals are weblogs. Free blogging tools are offered by various web publishing tools like Wordpress, Blogger, etc.. There is no best blogging tool to be used, rather each individual will find one that suits best for them. Wordpress and Blogger are the two most widely used. They are open for everybody at no cost and there is a lot of helpful information to be found in the internet on how to use them. Environments and Tools section offers some further insight into the use of these tools. If students are working in small groups, the instructor can request to receive logs of the group meetings. This way the student groups are more likely to stay on task during synchronous chats and the instructor will be able to keep track of the progress each group is making. This is also an effective way to know if and when intervention is needed to get a group back on track. For synchronous chats there are various instant messaging tools and realtime notetaking tools. Most well-known and recommended tools would be Skype, Google chat or MSN Messanger. On each one of them one can easily get message logs to send to the supervisor or get back to what was discussed during the conversation if forgotten. The instructor can create an online questionnaire to get some feedback from the students. There are some programs that can do statistical analysis of the questionaire responses. On-line questionnaires are one of the features that is offered by Google Drive among other file types that can be used for collaboration like writing, spreadsheets, presentations. Therefore Google Docs is a good software to be used for this purpose. One can easily create a questionnaire there and later on monitor the results. For the analysis of the data one can extract an excel file to be used in the personal computer. The internet offers a variety of other On-Line questionnaire tools like Doodle, Surveymonkey, KwikSurvey, etc but it is best to try them out yourself to find which is best applicable. A teacher / course designer should learn to know the learners and not only in the analysis phase of the course but throughout the design process. Continuous interaction between the teacher and the learners helps the teacher to understand the culture of the learners. This leads to designing a course that is culturally more rich and sensitive (Thomas, Mitchell, & Joseph, 2002). Teacher can prepare a pre-test to see the students' level of understanding of the most important concepts and ideas. If the students do not have sufficient knowledge of the subject matter, the teacher should provide some readings that can be discussed in smaller groups in study circles. The students should be divided into the groups in a certain way so that in each group would consist of one or two students with more expertise who would be able to tutor the students with less knowledge. The study circles can be implemented using an instant synchronous chat, such as Skype chat, along with questions that the groups need to answer (see also Part II, Synchronous chats). In Skype one can easily form groups for different study tasks. Later on, one can extract the message logs for later reviewing. Furthermore, if a user signs in later, he/she can easily review the information that was previously discussed and join in the converastion. Another important thing to be remembered about collaborative learning is that learning in a group is not always the best solution. There are ways of learning and problem solving for which individual tasking can be a more appropriate solution (Ibid). The most effective ways of learning in a group are, in general, brainstroming types of tasks where as tasks demanding planning and coordination may be better performed as individual tasks (Linn & Burbules, 1993, p. 93). Carefully designed combinations of individual and collaborative ways of learning can be seen as the most productive learning environment. At its best collaborative learning is best applied in situations where the members in a group have different views / perspectives on a specific phenomenon (cognitive conflict) and by sharing their individual knowledge and experiences they manage to construct shared understanding (Häkkinen & Arvaja, 1999). Chen, S. J., Hsu, C., & Caropreso, E. (2005). Cross-cultural collaborative online learning: When the West meets the East. Proceedings of the World Conference on E-Learning (E-Learn), 1931-1941. Fisher, Mercedes (2003). Designing Courses and Teaching on the Web: a "how to" guide to proven, innovative strategies. Lanham, Maryland: ScarecrowEducation. Havard, B., Du, J., & Xu, J. (2008). Online collaborative learning and communication media. Journal of Interactive Learning Research, 19(1), 37-50. Linn, M.C. & Burbules, N.C. 1993. Construction of knowledge and group learning. In K. Tobin (Ed.) The Practice of constructivism in science education. Washington: AAAS Press, 91-119. Montgomery, K. (2000). Classroom rubrics: Systematizing what teachers do naturally. The Clearing House, 73(6), 324-28. Thomas, M., Mitchell, M., & Joseph, R. (2002). The third dimension of ADDIE: A cultural embrace. TechTrends, 46(2), 40-45.